• Combined OA and solar UVR were investigated on the HAB-forming dinoflagellate Karenia mikimotoi using outdoors incubations. • This is the first study to consider the combined effects of OA and UVR on the toxicity of K. mikimotoi. • OA and UVR resulted in decreased pigment contents and increased UV-absorbing compounds and hemolytic activity. • The combination of OA and UVR had little effect on growth rates and toxicity of K. mikimotoi. A batch culture experiment was conducted to study the interactive effects of ocean acidification (OA) and solar ultraviolet radiation (UVR, 280–400 nm) on the harmful dinoflagellate Karenia mikimotoi. Cells were incubated in 7-days trials under four treatments. Physiological (growth, pigments, UVabc) and toxicity (hemolytic activity and its toxicity to zebrafish embryos) response variables were measured in four treatments, representing two factorial combinations of CO2 (400 and 1000 μatm) and solar irradiance (with or without UVR). Toxic species K. mikimotoi showed sustained growth in all treatments, and there was not statistically significant difference among four treatments. Cell pigment content decreased, but UVabc and hemolytic activity increased in all HC treatments and PAB conditions. The toxicity to zebrafish embryos of K. mikimotoi was not significantly different among four treatments. All HC and UVR conditions and the combinations of HC*UVR (HC-PAB) positively affected the UVabc, hemolytic activity in comparison to the LC*P (LC-P) treatment, and negatively affected the pigments. Ocean acidification (OA) was probably the main factor that affected the chlorophyll-a (Chl-a) and UVabc, but UVR was the main factor that affected the carotenoid (Caro) and hemolytic activity. There were no significant interactive effects of OA*UVR on growth, toxicity to zebrafish embryos. If these results are extrapolated to the natural environment, it can be hypothesized that this strain (DP-C32) of K. mikimotoi cells have the efficient mechanisms to endure the combination of ocean acidification and solar UVR. It is assumed that this toxic strain could form harmful bloom and enlarge the threatening to coastal communities, marine animals, even human health under future conditions. • The aquaculture can be effected by light intensity. • The effects of pCO2 on the production depended on the light intensity changes. • Pyropia yezoensis might be benefited from ocean acidification at low light. 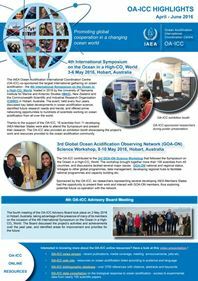 Increased ocean uptake of CO2, due to rising atmospheric CO2 is leading to ocean acidification (OA) and alters light intensity due to increased turbidity and depth variation in seawater. Macroalgae have been found to alter their behavior in response to OA and other climate factors. In order to optimize farming strategies for economically important seaweeds, this study assesses the growth of Pyropia yezoensis at three different light intensities (HL:35%; ML:10%; LL:5%) and two CO2 concentrations (ambient CO2, 400 ppm; elevated CO2, 1000 ppm). Results show that P. yezoensis growth was significantly inhibited by decreased light intensity, due to reductions in photosynthesis, relative electron transfer rate (rETR) and carotenoid synthesis. However, under LL conditions, the relative growth rates (RGR), maximum net photosynthetic rate (Pmax) and maximum relative electron transfer rate (rETRmax) of PSI and PSII in P. yezoensis, were significantly enhanced under elevated CO2 concentrations. Phycocyanin (PC) and phycoerythrin (PE) levels in P. yezoensis were simultaneously increased under elevated CO2 concentrations. This study demonstrates that algal species may adapt to ocean acidification in the future and avoid light-induced growth inhibition. Mariculture of the economically important seaweed will likely be affected by the combined conditions of ocean acidification that resulting from increasing CO2 rising and decreased light levels, especially under high culture intensity and high biomass accumulation. To examine this coupling effect on the photosynthetic performance of Sargassum fusiforme seedlings, we cultured seedlings of this alga under different light and CO2 levels. Under low light conditions, elevated CO2 significantly decreased the photosynthesis of S. fusiforme seedlings, including a decreased photosynthetic electron transport rate. Seedlings grown under the low light intensity exhibited higher photosynthetic rates and compensation irradiance, and displayed higher photosynthetic pigment contents and light absorption than seedlings grown under high light intensity, providing strong evidence of photosynthetic acclimation to low light. However, the captured light and energy were insufficient to support photosynthesis in acidified seawater regardless of increased dissolved inorganic carbon, resulting in declined carbohydrate and biomass accumulation. This indicated that S. fusiforme photosynthesis was more sensitive to acidified seawater in its early growth stage, and strongly affected by light intensity. Future research should evaluate the practical manipulation of biomass accumulation and mariculture densities during the early culture period at the CO2 level predicted for the end of the century. We established the relationship between gross photosynthetic O2 evolution and light-dependent O2 consumption in Trichodesmium erythraeum IMS101 acclimated to three targeted pCO2 concentrations (180 µmol mol-1 = low-CO2, 380 µmol mol-1 = mid-CO2 and 720 µmol mol-1 = high-CO2). We found that biomass (carbon) specific, light-saturated maximum net O2 evolution rates (PnC,max) and acclimated growth rates increased from low- to mid-CO2, but did not differ significantly between mid- and high-CO2. Dark respiration rates were five-times higher than required to maintain cellular metabolism, suggesting that respiration provides a substantial proportion of the ATP and reductant for N2 fixation. Oxygen uptake increased linearly with gross O2 evolution across light intensities ranging from darkness to 1100 µmol photons m-2 s-1. The slope of this relationship decreased with increasing CO2, which we attribute to the increased energetic cost of operating the carbon concentrating mechanism (CCM) at lower CO2 concentrations. Our results indicate that net photosynthesis and growth of T. erythraeum IMS101 would have been severely CO2 limited at the last glacial maximum, but that the direct effect of future increases of CO2 may only cause marginal increases in growth. • Local impacts may potentially increase effects of global environmental changes. • We assessed combined effects of reduced pH and shading caused by harbor structures. • Reduced seawater pH and shading affected behavioral responses of hermit crabs. • Multiple stressors induced high mortality and reduced growth. • Maintenance of local populations may be impaired by the impact of both stressors. Multiple simultaneous stressors induced by anthropogenic activities may amplify their impacts on marine organisms. 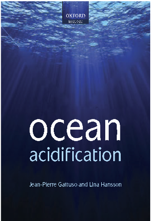 The effects of ocean acidification, in combination with other anthropogenic impacts (apart from temperature) are poorly understood, especially in coastal regions. In these areas, shading caused by infrastructure development, such as harbor construction, may potentially interact with CO2-induced pH reduction and affect invertebrate populations. Here, we evaluated the effects of reduced pH (7.6) and shading (24h in darkness) on mortality, growth, calcification and displacement behavior to live predator (danger signal) and dead gastropod (resource availability signal) odors using juveniles of the hermit crab Pagurus criniticornis collected in Araçá Bay (São Paulo state, Southeastern Brazil). After a 98 day experimental period, both stressors had a significant interaction effect on mortality, and an additive effect on total growth. No difference in calcification was recorded among treatments, indicating that individuals were able to maintain calcification under reduced pH conditions. When exposed to odor of live predators, crab responses were only affected by shading. However, an interactive effect between both stressors was observed in response to gastropod odor, leading to reduced displacement behavior. This study shows how local disturbance impacts may enhance the effects of global environmental change on intertidal crustacean populations.